Timo Kaukomaa is finishing off his doctoral studies in one of the world’s premier centres of interactional analysis. It’s an honour to host this guest blog, in which he explains his work – and why he is leaving it for a very different life. 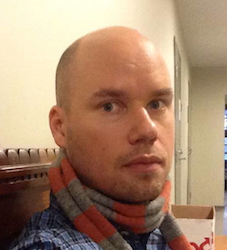 I am a PhD student in Sociology at the University of Helsinki, and a member of the Finnish Centre of Excellence in Intersubjectivity in Interaction, which comprises CA researchers in the fields of linguistics, sociology and behavioural sciences. I will soon defend my PhD thesis (in June), and I will reflect here upon my thoughts regarding my PhD project and future plans. My PhD study is about facial expressions of emotion in mundane dyadic conversations. The (three) empirical articles of my study examine the interactional trajectories of turn-opening smiles and frowns, and also how a listener’s facial expression is used to make a shift in the emotional stance of a speaker’s utterance. Moreover, what I found and argue in my study is that facial expressions are an important interactional resource in the collaborative construction and regulation of a situational emotional relationship and congruent understanding of participants. I thoroughly enjoyed working as a graduate student in the field of CA. I am grateful that I was able to conduct my study in professor Anssi Peräkylä’s research group, and be a member of our Centre of Excellence (CoE): both groups have greatly supported my growth as a researcher. Furthermore, our CoE has been of utmost important to me, as I worked there from summer 2012 till autumn 2014, when I submitted my PhD thesis. I cannot think of any better place than our CoE to work at as a PhD student, and I warmly recommend it to all PhD students and scholars working in the field of CA. Our local and international staff members, and many visitors, added to a versatile and plentiful program, provide an excellent environment for studying and networking. Now that I am about finish my PhD study and graduate, I can say a few words about my future career plans. At present, I am in the middle of a career transition, as I am moving away from CA community to a rather different field. I started a new Master’s program last autumn in Theology, in order to be a priest (hopefully by the end of 2016). One may ask: why this? Why now just after finishing a PhD project in an international field of research, with many great opportunities for a post-doctoral position? I have to say that I truly enjoyed working as a researcher at the university, and I definitely would like to conduct research (or write) in the future, but to be honest, there is one thing I was missing in the academic world: practical everyday work. As much as I enjoy research, I crave more practical work in helping other people. Moreover, going through a spiritual awakening not too long ago had a substantial effect on my career decisions. If I were to offer advice to PhD students who are pondering their future career choices, I would encourage them to listen to their hearts: pursue the goal that feels important and meaningful to yourself!